It still is my plein air set up! It has been overseas three times and all over the country. I have put it to the test. Since we are focusing on demystifying plein air on my Patreon page I thought it was timely to share this video again. It was a beautiful Spring day in Atlanta. 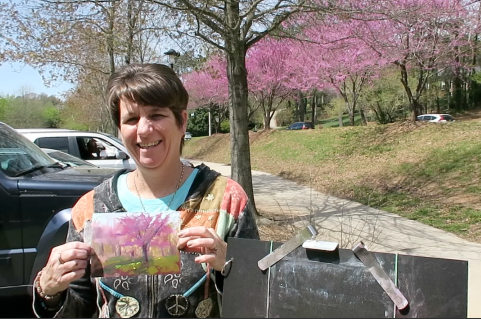 The perfect opportunity to try out my new plein air set up and shoot this week's video. I packed my new baby Heilman box (the double sketchbook), my tripod and some paper and my husband and I headed to the river. Michael volunteered to be the cameraman. That was great for me because I needed to get familiar with my new set-up. We decided to go the a park alongside the Chatahoochee River. I did a warm up painting and we decided the light would be better if I faced the opposite direction. I really wanted to find some blooming trees so we moved to another spot. The best spot happened to be right where we parked. There was a wonderful row of blooming redbud trees. Sure they were alongside a busy road. Yes there were houses and 'stuff' behind the trees. But it was a great exercise in simplifying and editing!